Discovering you lost important data is one of the worst feelings in the world. Sometimes it’s impossible to get back what you lost, but sometimes it is possible that what you lost still exists somewhere on your hard drive. If it’s there, these five free tools will help you find it. Although many Windows users know about the Recycle Bin, not everyone does. Even more importantly, not everyone knows how it works, so a file might be in the Recycle Bin even though you can’t find it. When you delete a file on Windows the regular way, Windows doesn’t actually delete it—it moves it to the Recycle Bin. When your hard drive starts to fill up, you can permanently delete files from your Recycle Bin. What many people don’t realize is that Windows can only use the move trick on a single drive. That means there may be more than one Recycle Bin on your computer if you use more than one drive (or you use removable USB drives). If you delete a file from the X:\ drive, you have to check the X:\RECYCLE folder to see if you can get your file back. There are several free Undelete programs on the Web, such as the one from EaseUS. Sometimes you lose data not because you deleted it, but because your hard drive is failing. If that’s the case, you can use a tool designed to recover data from a partially failed drive. I use the open source Disk Drive Rescue (ddrescue). When you run ddrescue, it tries to copy data from every part of your drive in big chunks to get off as much data as possible. When it encounters a problem (because your drive is failing), it makes a note and skips to the next chunk. After it gets as much data off as possible, it goes back and works on the edges of failed chunks to get every single bit of data it can off of your drive. I’ve used ddrescue to recover over 95% of the data from a failed drive. It also works on scratched CDs and DVDs, and it may also help you with damaged USB drives. Although photos are regular files, so you can recover them with Undelete software, you can also get them off with special photo recovery software. Undelete works by figuring out where your file was before it was deleted. Photo recovery software looks for the signature of photos on your drive, so it can recover photos even after you reformat your drive. Although not for the faint-of-heart, the SluethKit is collection of tools used by forensic scientists (think CSI) to recover evidence from computers. It contains a number of tools which help recover lost data—even deliberately destroyed data. It isn’t easy to use, but it can be your last resort option. Hi Mitz, you shared a lot of good tools to recover data. But I had not used that’s why I am unable to rate them. But I assure that the tool I used for data recovery is the best of all. Its name is “Piriform Recuva”. An outstanding tool to recover data. 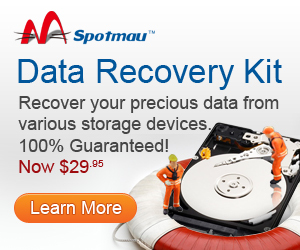 it gives you the opportunity to recover your data folder-wise. If anyone want to use this tool and feel difficulty, don’t hesitate to inform me. I will help you to use recuva.